Ever wondered what these tuxedo wearing birds enjoy eating? Where they’re from? Celebrated annually on April 25th World Penguin Day is a day that is meant to show appreciation to these cool birds and learn things such as biology, origin and more. In honor of this holiday we thought to include some cool information…enjoy! Worldwide there are currently 17 species of penguin. These flightless birds can be located mostly in the Southern Hemisphere from Antarctica to other places like South Africa and New Zealand. Spending the majority of their time in the water their diet consists of seafood life such as fish, squid and krill. The prominent black/white coat is used as a form of camouflage from predators in the water. From below their white chest blends in against the surface of the water and from above their black back appears like the dark depths of the ocean. During breeding season most species of penguin will build nests of rocks in preparation of a chick. Once a penguin has laid an egg most species share the incubation, while the other seeks food. Once the egg has hatched the chick will begin calling the parents to get them to recognize its voice. As you can imagine this helps a lot when the chick is left with a huge group! Be sure to stop by the Moody Gardens Aquarium Pyramid, the largest aquarium in Texas. 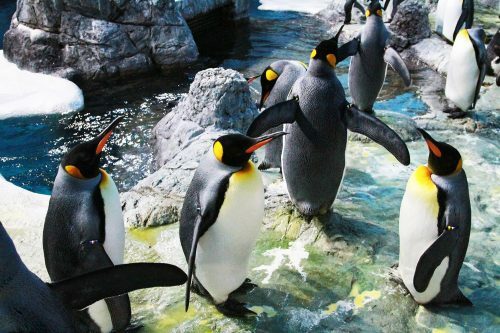 With 1.5 million gallons of water, the building houses life from four distinct ocean environments including more than 80 penguins such as Gentoo, Rockhopper, Macaroni, Chinstrap and King Penguins. Recent upgrades were made to the penguin exhibit earlier this year showcasing a swankier, brighter living space for our little friends. Click this link to see what our guys are up to! Previous Previous post: Who Runs the World…. Girls!